Jennifer Field is a mixed media artist living in Southwestern coastal Maine. She teaches felting all over the country and hosts workshops in her personal dream studio in New Hampshire. Jennifer’s background is in illustration, sculpture, graphic, toy and fabric design and after decades of working exclusively with glass and metal, she fell madly in love with felting wool. She loves combining different felting techniques and mediums in her sculptures and loves the juxtaposition of hard and soft forms and the lovely and subtle layering of colors. Her preferred subject matter inspired by nature: Birds, animals, flowers and sea life are among her favorite forms. 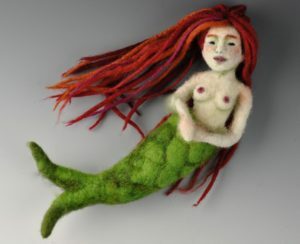 In this one day class, needle felting techniques will be explored to create a magical small mermaid/talisman using colorful wool fleece. Some felting experience is helpful but not necessary. I will cover basic wire armatures, simplified facial features, long “hair” application and fingers(if you participate in the entire weekend). Your mermaid can be embellished with personal charms and glass beads. Your mermaid can be a self portrait or someone you adore. 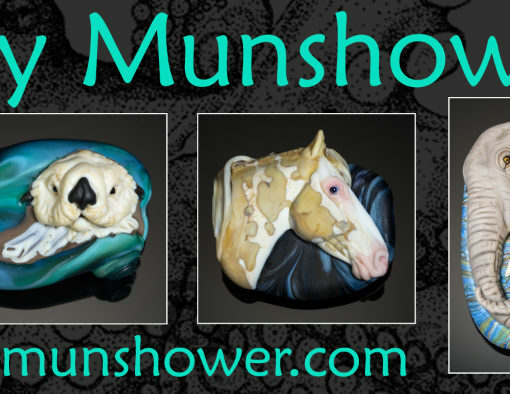 She can be combined with your Mermaid Necklace as a beautiful display/sculpture. 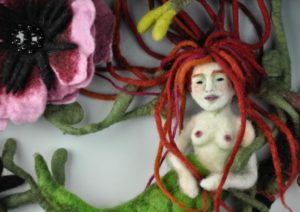 $40 per student Kit includes Mermaid armature, wool fleece, handmade wool yarn for hair, basic needle felting kit (foam, extra needles, single needle holder). TIMe to unplug, smell the sea air and find your inner Mermaid. 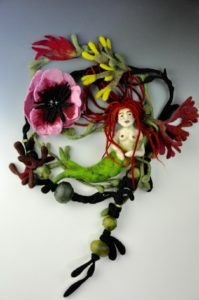 In this variation of my Fire & Fleece workshop students will focus on creating organic “sea glass” hollow and big holed glass beads and learn the joy of working with super fast felting,soft and colorful short fiber merino wool to create a sculptural mermaid necklace/wall hanging. 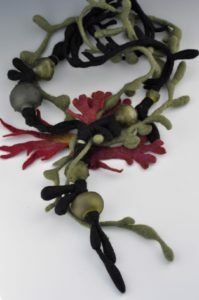 We will create a beautiful tangle of colorful felted seaweed encasing the beads. 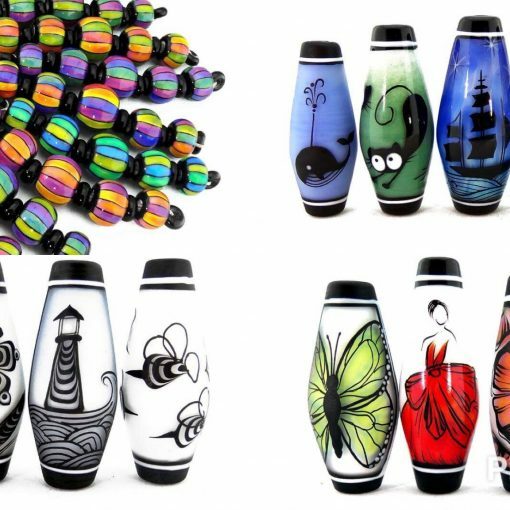 Glass and fleece mix beautifully and the color combinations are unrestricted and the possibilities are endless! Day ONE: Students will start the day making a simple wet felted wool tropical flower. Flowers are a great way for students to learn a few wet felting techniques and familiarize themselves with the super soft, fast felting short fiber merino wool and all the yummy colors. Hopefully it will also spark a wave of inspiration. 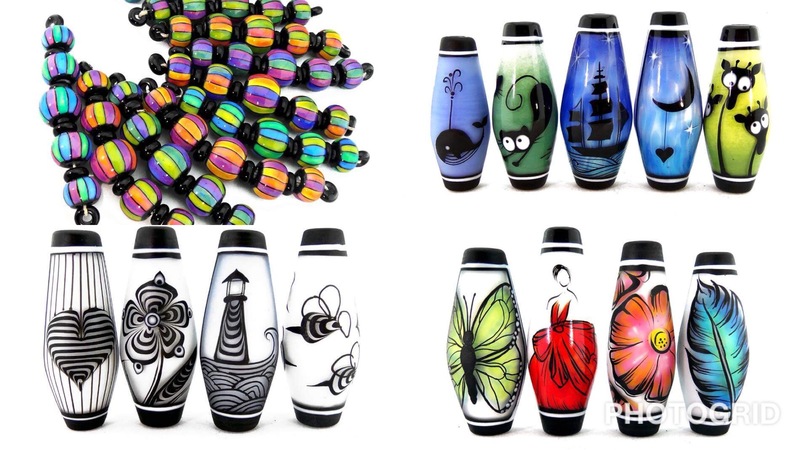 After a brief show and tell, I will give a few quick demos of suggested beads(experienced beadmakers can just go for it) Students will then hop on the torch and create a variety of large holed hollow and solid beads and spacers and a fun glass headpin for their flower. 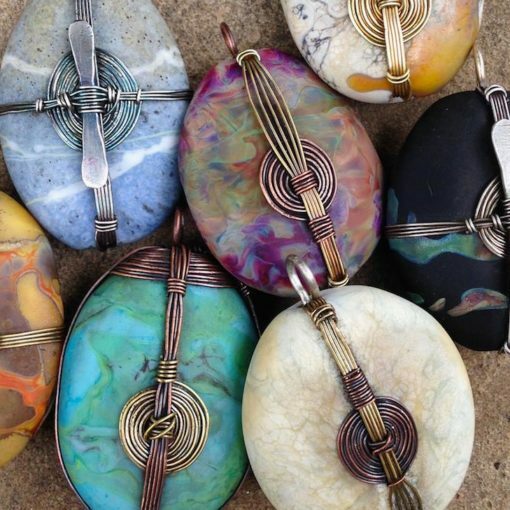 Students can also bring big holed beads, small stones, sea glass and charms they have created or collected and use this time to make a bunch of new “sea glass” beads. Day TWO: After cleaning and etching our kiln booty, we will explore a variety of wet felting techniques to create a felted forms including cords, sheet felt, beads and dangles and then felt a sealife(or floral) inspired necklace around their beads. Students will also learn how to felt around found objects like small beach stones, shells and sea glass pieces. 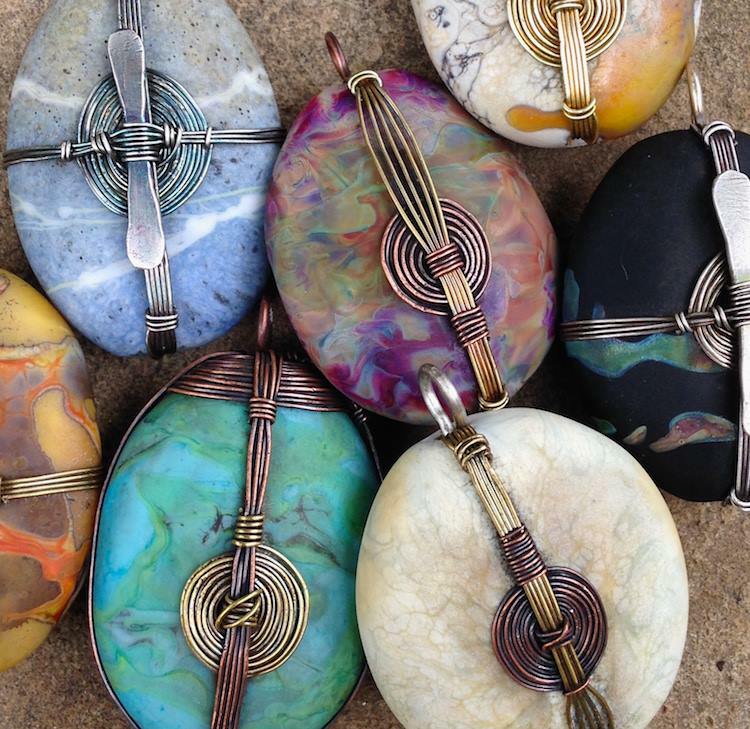 This will be a fun & colorful workshop for advanced beginners to seasoned lamp workers and felters eager to try a new combination of mediums! colorful short fiber merino fleece. an OLD bath towel(not your best) and VERY SHARP pointy scissors-large and small( (I like Fiskars).